Dr. Singha's Mustard Bath 32oz. 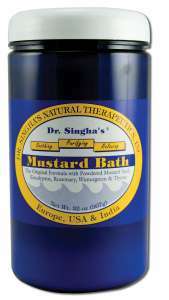 Home > Natural / Organic Products > Natural / Organic, Hair, Skin Care Products > Dr. Singha's Mustard Bath 32oz. Foot Bath - Disolve 1 large Tbl. spoon of the formula in a bowl of hot water. Soak for 20 minutes. Rinse with cold water. Full Bath - Add 2oz to a hot bath. Relax in the water for 20 minutes. Finish with a cold shower, dry with a rough towel and keep warm for best results. Dr. Shingha's aromatic bath formula has been widely used in England for 35 years with excellent results. Traditionally, Mustard is renowed for its stimulating, cleansing and rejuvenating qualities. The warmth of the Mustard assists in opening the pores of your skin helping you to sweat out impurities. Dr. Shyams Singha, well-known Master Acupucturist, Osteopath, Nauropath and Ayurevedic physician recommends his formula as an aid in relieving many ailments. These include Stress, Muscle and Joint Soreness, Congestion, Skin Conditions, Periodic Tensions and Sleeplessness. Use as a perfect complement to any Purification and Tissue Cleansing Program.